In 1900 Grand Rapids was a bustling river town, not fully settled, but no longer frontier. The red light district was located in the river valley while the mansions of the wealthy overlooked the city from Heritage Hill. Only seventeen years earlier, the last great log run swept away the railroad bridge near Ann Street. Crowds gathered along the banks of the Grand River to watch as thousands of white pine logs created a jam seven miles long and thirty feet deep. Perhaps this is why so many furniture factories started in the “valley city” — cheap wood, cheap water power, and cheap labor. 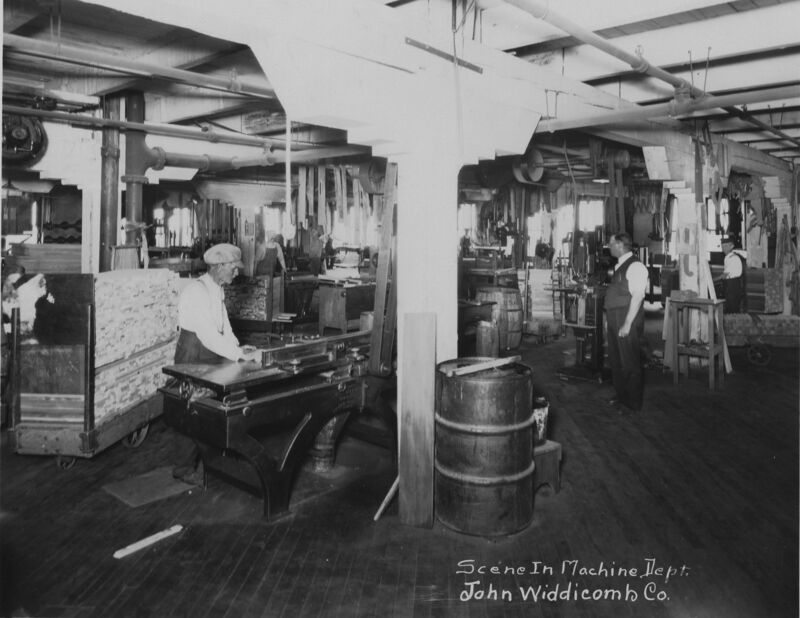 Scattered along the river and throughout the city were 85 furniture and woodworking factories. Berkey and Gay, Widdicomb, American School Furniture Co. (American Seating), Sligh, Stickley Bros. and others were just then making this medium size city of 87,576 the furniture capital of the United States, a title it held until the Great Depression. It was this cheap labor that bothered Thomas Kidd, secretary of the newly formed Amalgamated Wood Workers International Union (est. 1895). Low Grand Rapids wages were depressing the earnings of his members. If the union was to grow, Grand Rapids workers needed to be brought into the fold. 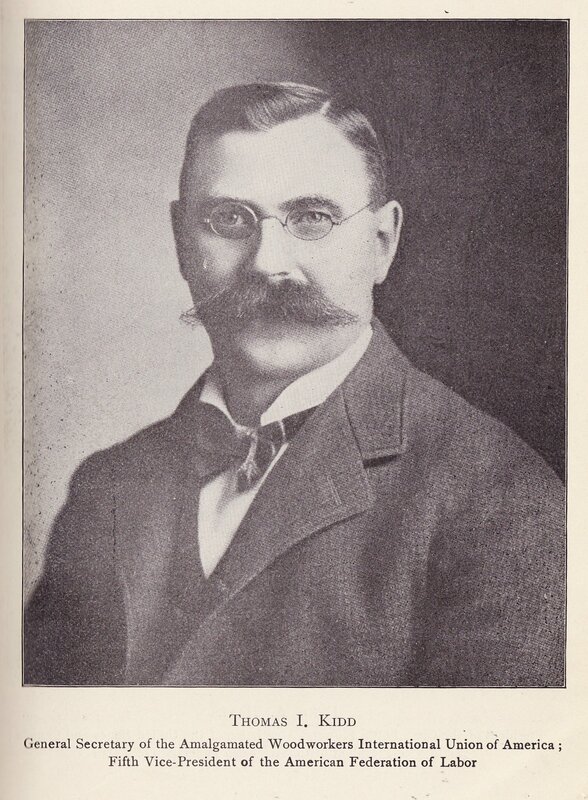 Kidd made numerous speaking trips to the city passionately and eloquently presenting his case to the English, Irish, German, Dutch, Polish, and Lithuanian finishers, rubbers, cabinet makers, sanders, and machine hands who compromised the 7,000 workers of Furniture City, USA. Despite Kidd’s best efforts, Grand Rapids Local 46 and Spindle Carvers Local 84 never numbered more than 200 members. In March, the AWWIU held its national convention in Grand Rapids. If the workers would not come to the union, the union would come to them. As hosts, Local 46 and 84 hand made convention badges of “white maple veneer handsomely lettered and mounted.” Sixty-eight delegates attended the week long session. An invitation was sent by the delegates to the local furniture manufacturers inviting them to meet with the union’s officers to discuss the advantages of the union label. Sligh, Rettig & Sweet, and the Luce Company agreed to meet. The appointed time came and went, but no furniture representatives. Unwilling to was the evening, the AWWIU officers decided to take in a performance at the Powers Theater. And what should be playing but “Sappho,” a performance so risqué, with the actress who portrayed a Greek heroine baring her arms and feet, that it had been banned in New York City and Kalamazoo, Michigan. However, this was not the only thing laid bare that night. It seems the lure of culture was too strong for even upright, respectable businessmen, for there, seated in the crowded theater, were the errant furniture barons. Kidd never did organize the furniture workers of Grand Rapids, despite his charismatic appeal and unceasing efforts. It would take another organizer and another union to lead Grand Rapids furniture workers in the Great 1911 Furniture Strike. This entry was posted in Anti-Capitalism/Labor and tagged Amalgamated Wood Workers International Union, Grand Rapids furniture workers, Grand Rapids Labor History, unions in Grand Rapids. Bookmark the permalink.